How to Climb Stok Kangri (6,153m), Leh and organise it yourself. For those who visit Leh, Stok Kangri (6,153m) is never far from the mind. It dominates the city’s skyline to the south, the highest peak amongst a series of perennially snowcapped mountains. Stok Kangri’s proximity to the city hints at its attainability, and for many visitors summiting the mountain becomes the goal of the trip. And so it did in our case. Having returned a few days early from three weeks of fieldwork in the Tso Kar-Tso Moriri area, my friend Anna and I had a week spare in Leh before our flights back to Delhi. We were well acclimatised for a six thousand metre peak, having spent several nights sleeping above 5,000m and, after a rest day in Leh where we organised our expedition, we headed out to attempt a three day summit of Stok Kangri. Below is a hopefully useful guide that sums up our trip, how we organised it, and some recommendations for planning your own trip. Step 1 – Organise the expedition in Leh. It’s possible to organise the expedition before you arrive in Leh, but you’ll have the greatest selection of guides and agencies at your disposal when you’re actually in the city, and prices tend to be significantly lower when you book in person. In Leh, you can find a guide that best suites your needs, and you’ll actually have the opportunity to talk through the trip with the guide in person. The average asking price for a four day trip (all inclusive except tips) seemed to be around 25,000INR per person, with discounts for larger groups. The Stok range hangs above Leh. Stok Kangri is furthest to the right, jutting into the clouds. Our experience: Through our previous expedition guide, we managed to find a guide (11,000INR total) to accompany us for the night of the summit and organised pretty much everything else ourselves. This was a significant saving on booking through an agency, but required a little more planning. We also decided to carry all our gear ourselves, but agencies can arrange for pony trains if you want to carry a lighter load. The village of Stok (after which Stok Kangri is named – Kangri translates to peak) is a 10km ride from Leh. If you’ve got a package trip, the journey should be included, if not, a taxi to Stok will cost a bit over 1,000INR each way. It’s a great drive, with Stok Kangri hanging menacingly over the village. There’s a palace in Stok, and a few tea shops and snack huts at the start of the trail. Before you begin the hike, you’ll have to pay a 60INR per person wildlife protection fee at the base of the trail, which goes to supporting the conservation of the snow leopards in the surrounding area. From the start of the hike, you’ll be following the course of the Stok River up the valley. The slope is fairly gentle to start with, and you shouldn’t find it too hard going, even if you haven’t been at altitude for long. Easy going: We were guided to base camp by our friend and previous expedition guide, Tsering. The path steepens occasionally at points, but this doesn’t last, and perhaps the most tricky bit of the opening gambit is the river crossings as well as the path’s open exposure to the elements (for us the main worry was too much sun). After two to three hours you should arrive at the Changma Tea House (4,000m), which serves a mean cup of chai and decent coffee for a handful of rupees. If it’s late in the day or your suffering from the altitude, it’s possible to camp at or near the teahouse, but most people continue on to the Mankarmo camp, from which base camp is an easy day hike. Assuming you’ve continued on, the hike to the Mankarmo camp is a relatively short one. This section is marginally steeper than the last, and you will become fairly intimate with the river, as you are forced to cross through the freezing water (it is fed by the Stok glacier). From Changma, take the left hand path at the fork, cross the river and climb to a small monument adorned with prayer flags. Continue down into the next valley, and keep following the river. The landscape becomes increasingly dramatic, and the valley is flanked by cliffs of rock which rise to needles. Eventually prayer flags appear on the horizon and you’ll spy the colourful tents of the Mankarmo camp. You can set up your own, or rent an already set up tent for 1,500INR per person (includes all food, drink and unlimited water refills). The tents come with some bedding, but I advise you to bring your own sleeping bag as cleanliness is not guaranteed and the temperatures drop significantly at night. From Mankarmo you can clearly see the eastern face of Stok Kangri and blue sheep roam the fringes of the camp, nimbly climbing the steep walls. The sound of the river is ever-present and provides the score to a great night’s sleep. The food in the dining tent is good, if basic, and vegetarian. If you feel low on energy, pile on the dhal, it is fantastic for aiding recovery. Breakfast is served from 7am at Mankarmo, allowing you to make a quick start to base camp. The trek took us just under two hours with few rests, and the path is well marked throughout, again following the course of the Stok River. The hike to base camp is steeper than to Mankarmo, with an elevation change of around 600m over a shorter course. Base camp: the night before the summit. Base camp is located in the valley to the north of Stok Kangri (the left side as you ascend) and is often much busier than the Mankarmo camp, as groups tend to spend several days acclimatising here (and only one night at Mankarmo). There is a significantly larger dining tent, which tends to be filled with people during the day, and is where you hire equipment (boots, crampons, axes, harnesses, rope, all 200INR), pay for permits (3,500 INR – slightly more expensive than in Leh – passport required) and get all your meals and snacks. You can hire tents for another 1,500INR per person and the deal includes all the food and drink you could ever want (though chocolate bars and new water bottles aren’t included). You can also make requests for packed breakfasts etc. for the climb ahead and get updates on weather conditions for the days ahead. If you are already acclimatised and feeling healthy, as we were, you can attempt the summit that same evening. If you are not acclimatised then I strongly suggest you seek advice on how many days you might need, and use this time to do lower, acclimatisation hikes from base camp. Once you are ready to go, your guide will likely suggest a time either side of midnight to leave, depending on the fitness of the group. We left at just before 1am, with the aim of summiting for sunrise at around 6.30, but several of the other groups left closer to 11pm. Be prepared to spend a long day (10hrs plus) on the mountain and bring enough clothes to fight off the night cold and windchill. The top is another 1,000m up from base camp which corresponds to a temperature decrease of 9.8°C, not factoring in the typically higher windchill at the top of the mountain. The climb starts up a rocky path with a steep ascent from base camp. This takes you to a ridge which brings you around to the lateral moraine of the Stok Glacier. Picking a path through here can be arduous, and some of the rocks become incredibly icy. While crampons aren’t yet needed, it’s wise to keep your head torch on at all times to spot icy patches. At around 5,500m, you’ll make the crossing of the glacier, at which point it is a good idea to affix your crampons. You’ll have to take them off again when you reach the moraine on the other side, but it is worth it for the stability on the ice. Once over the moraine, you’ll enter the snowfield proper, which becomes incredibly steep. At this point, the altitude really starts to kick in to effect, and step count rapidly decreases from 50 to about 10 towards the top of the slope. The path is well marked and you can follow the torchlight of other groups, but a guide is highly recommended if this is your first time up the mountain. The approach to the summit. Our guide Anchuk leads Anna, bound by a rope over the shoulder. The snowfield leads to the ridge, a mix of rock and ice that is not for those with vertigo. The ridge drops about 600m on each side, and any fall would likely result in a trip to the bottom. Most people rope up for this section, if only for a sense of added security. The path winds around the ridge, and while there’s no real “climbing” you’ll have to be hands on with the rock at some points as you make your way to the top. The final ascent is marked by one last snowfield to the top, where if you have timed your climb well, you will be rewarded by a fantastic sunrise and on a clear day, views to K2 in the Karakoram Range 220km away. Enjoy it! By the time you’ve summited, you’ll be pretty exhausted, and the adrenaline begins to wear off on the way down. Though each step down becomes easier due to the increasing oxygen, it is still a pretty hellish climb. Steep slopes do terrible things to cold knees, and you’ll soon be wishing for a nice pair of skis to get you quickly off the mountain. Before you know it though, you’ll be back across the glacier (which becomes even icier once the sun is up) and then tracking the nicely marked path back to base camp, where you can R&R. Depending on what time you get back, you may want to spend another night at base camp before returning to Stok, but many make the descent to the town that same day, lured by the idea of a proper bed in a hotel. Our first night at base camp was so cold that we decided the idea of another wasn’t worth the rest, and decided to return to Stok that day. 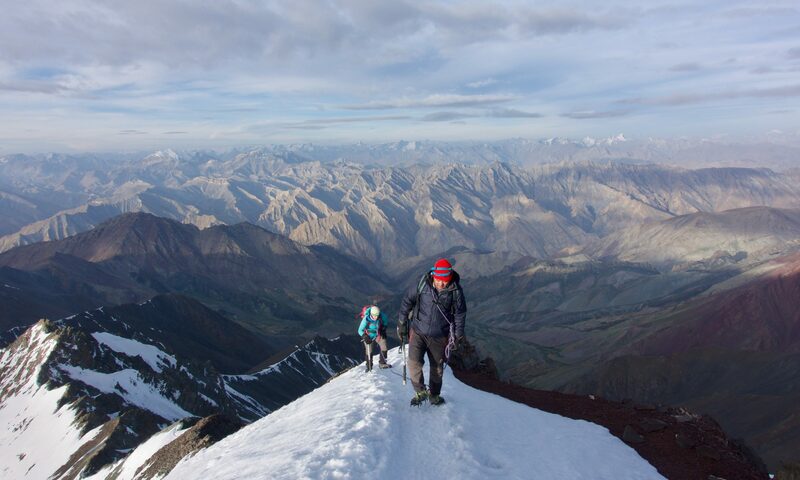 Compared to the summit attempt, the return to Stok is a piece of cake, and you’ll whizz down it on lungs grateful for the ever increasing oxygen levels. The mountain takes on a new dimension on the descent and is a great half day trek, made better by the fact you’ve just summited a 6,000m peak. Have another tea at Mankarmo, Changma, and wherever you feel like you deserve one. There’s one final tea shop at the bottom of the trail, which is a great place to celebrate before the taxi ride back to Leh. Congratulations! Starred items can be rented or bought at Mankarmo and/or Base Camp. Thanks for reading and I hope you found this a useful introduction to the mountain. While I’ve tried to write this as accurately as I can, it doesn’t replace the knowledge and comfort of having a local guide. All information sourced from our climb in August 2017. Timings based around two relatively fit, well-acclimatised, mid-twenty year olds.